The Tester is coming back to the PlayStation Network tonight. Why should you care? Because it's the first step towards Sony (hopefully) becoming an Emmy contender. 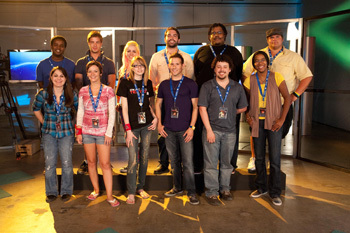 Today, Sony's returning to reality television with its second season of The Tester, the show that pits hopeful gamers against each other in a variety of competitions until only one is left to claim the prize of a job as a game tester at Sony's San Diego studio (along with a signing bonus and some other prizes). Those who were fans of the first season are probably going to enjoy themselves already, but Sony is trying to turn the dial up to 11 in order to make the show even more appealing. The first season of The Tester didn't exactly garner a lot of love from the critics, but it proved to be a success amongst viewers. In an online survey that was conducted with a random sample of over 2000 PSN registrants last March, over 60% percent watched multiple episodes of The Tester and would like to see more, though they did indicate that they wanted more drama amongst the contestants. "It was really the community and the viewers that showed what the true testament of the entertainment value was," said Susan Panico, Senior Director of the PlayStation Network, in a recent interview. "We did talk to our community about what was interesting to them ... the audience responded very positively, and that's what's really important." Unsurprisingly, Sony and 51 Minds Entertainment are promising that this season will be even bigger and better than before. Panico promises that more drama will be on display (understandable, seeing as how this is a reality competition), and viewers can now participate thanks to the weekly "Download & Win" contest. Prizes available to win will include the Ultimate Edition of God of War II (signed, of course, by Stig Asmussen), a Sony HD HandyCam, and a PlayStation Move Bundle. There's also a bigger cast of judges in the show than there was before. Brent Gocke, senior release manager for SCEA, and Meredith Molinari are returning as panelist and host, respectively, but the other regular panelist will be Adrianne Curry, the winner of the first season of America's Next Top Model and an avid gamer/cosplayer. Meanwhile, guest panelists have been revealed as some pretty big names in the videogame industry: Stig Asmussen (Game Director for God of War III), Ted Price (founder and CEO of Insomniac Games), Greg Goodrich (Executive Producer of Medal of Honor, Michael McWhertor (Kotaku's Reviews Editor), Deborah Mars (Senior Producer of SCEA's Santa Monica Studio), and Travis Williams (Senior Producer of SCEA San Diego). As it turns out, The Tester is just the start of Sony's plans for original programming. According to Panico, Sony wants to eventually be like HBO or Showtime by providing high-quality, original, content on the PlayStation Network ... though, we probably shouldn't expect Sony to create anything as epic in scale or cost as, say, Rome, Deadwood, or Dead Like Me. "By no means am I comparing The Tester to The Sopranos," said Panico, "but I hope that five years from now, the Playstation Network will be an Emmy contender or an Emmy winner for really entertaining and compelling content." For those critics of the show who have belittled the contestants' goal of becoming a game tester, Sony wants to point out that the end of the show is actually just the beginning of these winners' careers. For Will Powers, AKA "Cyrus," the winner of the first season, the show gave him a foot in the door of the videogame industry, but he's managed to proceed up the corporate chain on his own by recently joining Sony's PR team. It'll probably be a while before we can judge how successful The Tester is at paving the way for Emmy-worthy programming. That said, it sounds like the second season is certainly going to be an entertaining distraction for a reality TV fan, and you can't really knock a show too much when the prize is to give someone a job in what is still a rough economy. To learn more about The Tester, check out the show's official site.